One of my heros has passed on. 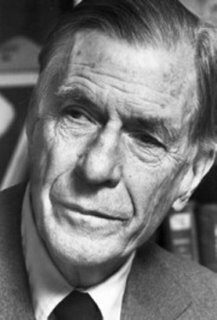 Liberal economist John Kenneth Galbraith died at the ripe old age of 97. I had been hoping he would make it to 100. John Kenneth Galbraith, the Harvard professor who won worldwide renown as a liberal economist, backstage politician and witty chronicler of affluent society, died Saturday night, his son said. He was 97. Galbraith died of natural causes at Mount Auburn Hospital in Cambridge, where he was admitted nearly two weeks ago, Alan Galbraith said. During a long career, the Canadian-born economist served as adviser to Democratic presidents from Franklin D. Roosevelt to Bill Clinton, and was John F. Kennedy's ambassador to India. I just recently noted that Galbraith headed a list of prominent 90 year olds. He was also on my list of the 100 people who have most influenced me during my life. The one time I got to see John Kenneth Galbraith in person was when I still considered myself to be a Republican. I was at Texas A&M and attended a special program that featured William F. Buckley Jr., the prominent conservative I knew from his PBS show "Firing Line". I attended the event wanting to see Buckley and had no idea who the fellow was he would be debating. As it turned out, his debate partner was Galbraith and they were arguing over the merits of having a strong federal government, with Galbraith naturally taking the pro-government side. While I didn't immediately change my views after that event, I did walk away with a favorable impression of Galbraith and over time I gained more and more respect for him as my opinion of Buckley declined. Galbraith was a prolific author and today I own about a dozen of his books. But then, that was about the only way to get his viewpoint. While Buckley had his own TV show, his own magazine and a nationally syndicated column, Galbraith's only outlet was through his books which I would pick up at Half-Price Bookstore every chance I got. It's a shame that more people end up being exposed to that blowhard Buckley than they are to Galbraith. I think it explains in part why the electorate is so foolish as to put incompentent people like George W. Bush in the White House. I’ve said before that Republicans would probably be happier once they are back in the minority. They need Democrats to be in power so that they will have someone to blame for all the countries problems. Somehow blaming everything on outspoken Hollywood liberals like Michael Moore or Jane Fonda who have zero influence in Washington just doesn’t quite cut it. So now we have a concerted effort to shine the light of culpability on Mary McCarthy, a veteran CIA analyst who was just 10 days away from retirement when she was “fired” for undisclosed contacts with the media and for allegedly leaking classified materials — a charge that she denies. Rightwingers have been making a big deal out of the fact that McCarthy gave $2,000 to the Kerry campaign during the last election cycle and they have insinuated darkly that she sought to use her insider status at the Agency to damage the White House and hurt Bush’s chances at re-election. But the CIA has said she was not believed to be the person who exposed the CIA’s rendition program and its secret prisons in Eastern Europe, and they are apparently not taking the case all that seriously. They are not charging her with any kind of crime, nor are they launching a specific investigation targeting her. They are not even trying to penalize her by taking away her pension, thus the firing 10 days before her retirment has practically no ill effect on her whatsoever other than causing some embarrassment and spreading her name all over the news. Meanwhile, these same rightwingers while pointing out McCarthy’s political ties have conveniently ignored the fact that the person who chose to fire her is Bush’s hand-picked choice for CIA director Porter Goss, a right-wing Republican and former congressman from Florida. The Washington Post the other day had an editorial criticizing Goss for his selectivity in going after McCarthy while doing nothing on many other more pressing matters. So the Mary McCarthy firing seems little more than a PR ploy by Mr. Goss. But conservatives like my friend Bill Crawford are almost desperate to make it into something much more convoluted than that. My Haloscan problems persist, but at least it looks like someone has finally identified the problem. Now I am just wating to find out if there is a solution. One of the 3 servers that handles the comment loads seems to not be working correctly for just your account for some reason. I'll look into this and get back to you. Just on my account? Aren’t I lucky! At least I know now that it is nothing that I did. Hopefully they will figure out how to correct it and I will just be patient for a few more days. I can’t believe they are hiring a guy named Snow to be the president’s new press secretary. Slang To overwhelm with insincere talk, especially with flattery. I think it says everything you need to know about Fox News that President Bush taps one of their news anchors to be his spokesman. Fox is the closest thing we have to a state-run media in this country. Bush just keeps falling and falling. President Bush's approval ratings have sunk to a personal low, with only a third of Americans saying they approve of the way he is handling his job, a national poll released Monday said. That’s pretty bad. And there is not much that Bush can do to turn things around as historian Sean Wilentz notes in his recent piece for Rolling Stone. Bush’s problem is that he was elevated way above his level of competence when the Supreme Court annointed him president in 2000. He was already a miserable failure as a businessman at that point, running several companies into the ground before being saved each time by wealthy Bush-family friends. But he had done OK as governor of Texas, a state with a weak governor system that invests most of the governing power with the lt. governor. And before that he was at his best as the figure-head owner (2 percent) of the Texas Rangers baseball team. But Washington, D.C., has proved to be his undoing. I think he went to Washington with the best of intentions, truly believing his own speechwriters who told him he was a “uniter and not a divider.” But what he found was a political environment that was already bitterly divided over the Clinton impeachment fiasco and he decided to try to get along by following his gut instincts, which were never that good to begin with. The best that Bush can hope for now is that the electoral system is already so skewed in favor of incumbents and the wealthy that it will prevent the kind of political sea change that shoved Democrats into the minority two-years into the Clinton presidency. Only by holding on to a slim Republican majority will Bush manage to keep the lid on the numerous festering scandals that have plagued his incompetent administration. I was glad to see this bit of news the other day. It looks like the Star Trek franchise will be back in 2008 with a new feature film helmed by the guy who is doing the latest Mission Impossible movie. It will reportedly feature an all new cast as it looks at the early days of Star Trek (but not as early as the now defunct “Enterprise” series) when the young James T. Kirk and Spock first meet. I wonder if they will give William Shatner a cameo?